The Evolution  Creation debate and Government Funding in the USA. On the other hand, is it true that the US federal government consistently avoid funding religion in any shape or form ? Does such an proposal stand up to any close scrutiny? And does it reflect past or current practice? When one takes an unbiased look at the U.S. National Parks system and in visiting sites administered by the same, one often comes upon exhibits and information that definitely promote religion. Although the religion presented is obviously of a form that is considered politically correct, it is religion nonetheless. One example is Devils Tower National Monument, Wyoming. At the site, amongst the exhibits providing geological and historical information, there are some that provide and promote First Nation pre-Christian religious beliefs. 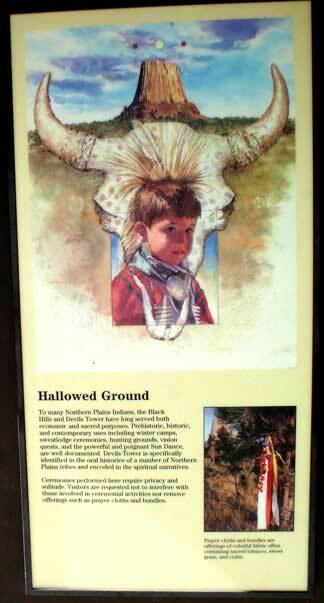 One in particular is the religious belief that Devils Tower is "hallowed ground". 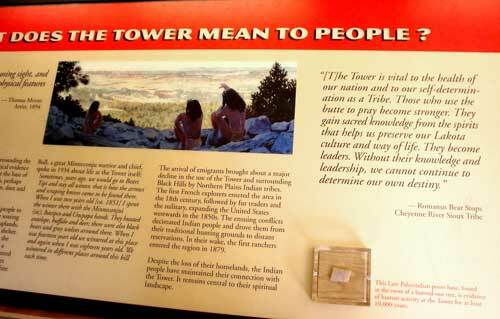 Exhibits also indicate that Devils Tower is a place where individuals come to communicate with spirit beings. All this is being done using federal money. One could protest that such a practice violates separation of Church and State, but no such protest come up here. It seems that if the religion promoted is perceived to be "politically correct", then it is legitimate, fundable and not subject to being censored or deliberately ignored. If other parks in the U.S. National Parks system are examined, one should not be surprised to find similar double-standards. Judeo-Christian beliefs are not welcome, religions that are deemed politically correct are.